French opera owes much of its obsession with exoticism to the pivotal figure of Félicien David, a pioneer of ‘musical Orientalism’. His opera Lalla Roukh, first performed to huge acclaim in 1862, was the catalyst for the explosion in operas set in the ‘Exotic East’. The fairy-tale plot revolves around an Indian princess who travels to Bukhara (part of modern Uzbekistan) to meet the man to whom she is to be given in marriage. Along the way she falls in love with the minstrel Noureddin who is, in fact, the King of Bukhara in disguise. 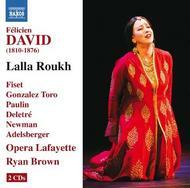 David’s evocative and magical orchestration is harnessed to memorable melodies, including Lalla Roukh’s deftly harmonized arias ‘Sous le feuillage sombre’ and ‘O nuit d’amour’.